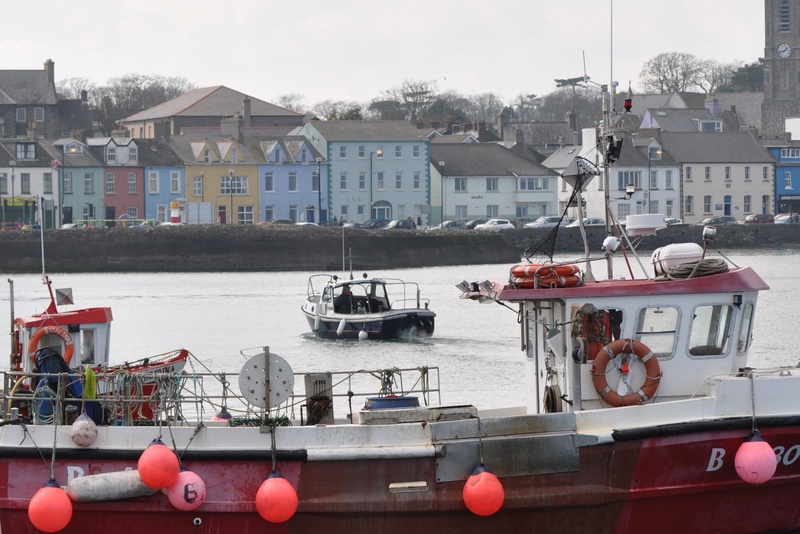 I was delighted to use this blog as an excuse for a trip to the seaside at Donaghadee, which is only 11 miles away, but which seems to catch more sunshine than my home on the Distant Drumlin. That photo contains at least three restaurants. After your meal, I recommend walking past the left edge of the photo to reach the pier and the lighthouse and enjoy a view back towards the town. For many years Donaghadee was the main port for links between Ireland and Scotland. According to the website www.visitdonaghadee.com, “the majority of Ulster-Scots settling in Ireland will have travelled through Donaghadee”. I stood on the pier to take the next photo. 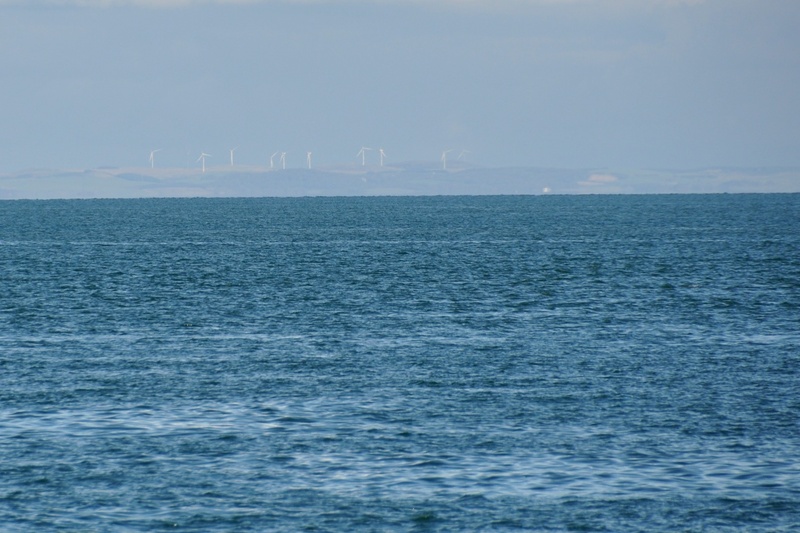 If you peer through the haze, you can just make out a wind farm on the Scottish coast. Once you’ve seen that view, you won’t be surprised to learn that regular crossings were made for centuries between Donaghadee and Portpatrick on the Rhins of Galloway. Nor, after seeing the windmills, will you be surprised to learn that westerly gales caused problems on the Scottish side, eventually diverting traffic to the more sheltered Stranraer port in Loch Ryan. That in turn led to a decline in Donaghadee’s fortunes, as the ports of Larne and Belfast took more of traffic coming from Stranraer. 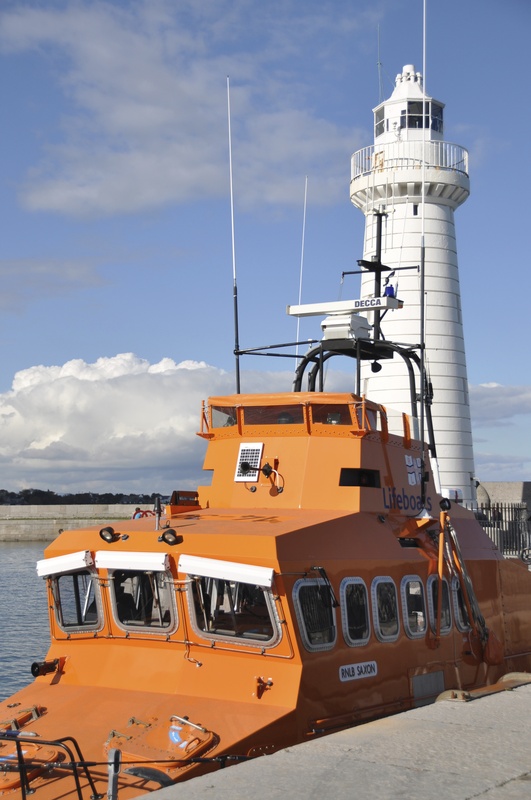 Donaghadee is however, still important as a lifeboat station. Donaghadee doesn’t really have a beach, but it has rocky shores and a grassy area called The Commons. 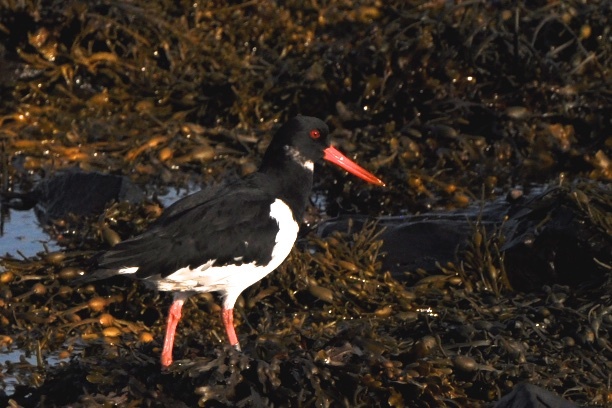 On the rocks below the Commons I spotted a pair of oystercatchers. This bird is ringed – perhaps by the Copeland Bird Observatory on an island close to Donaghadee? The origin of the name Donaghadee is not clear. The PLACENAMESNI website considers theories connected to Saint Patrick and to David, a 6th century Welsh bishop, but comes down in favour of the Irish Domhnach Daoi meaning “church of the motte”, because that could refer to the mound in the middle of the town. 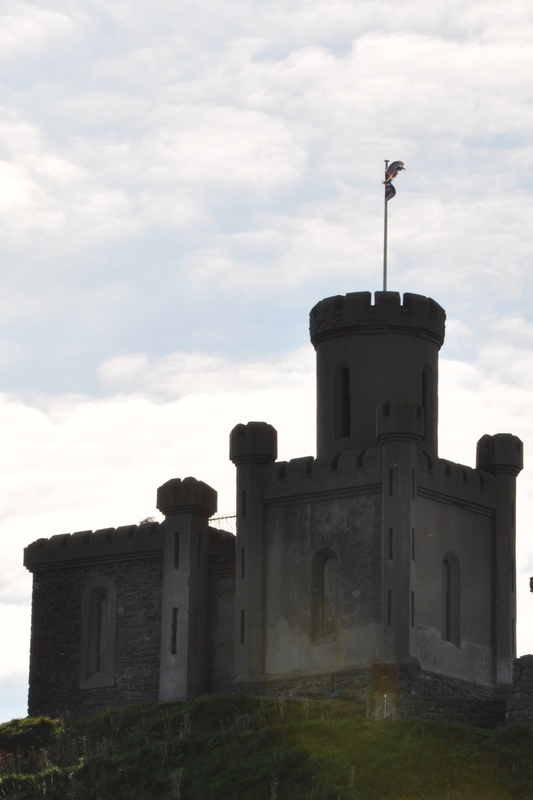 The stone building dates from the 19th century, when it was built to store explosives used in extending the harbour, but the mound is much older. I’ve had requests from readers for help pronouncing some of the placenames on this blog. Here is my guide to saying “Donaghadee” like a local. Step 1: Prepare for a rhythm like “clickety-clack”. Step 2: Say “Don” to rhyme with “John”. Step 3: Have a go at “agha”. Think of the “gh” in “Gallagher”, or the “ch” in a Scottish “loch” or a German “J.S. Bach”. Or just give up and say “acka” – that will work. Step 4: Say “Dee” to rhyme with “sea”. And then don’t worry. Even on gravestones the name sometimes gets abbreviated. Can you see it in the next photo? Donaghadee has a Historical Society. Click here for their website. 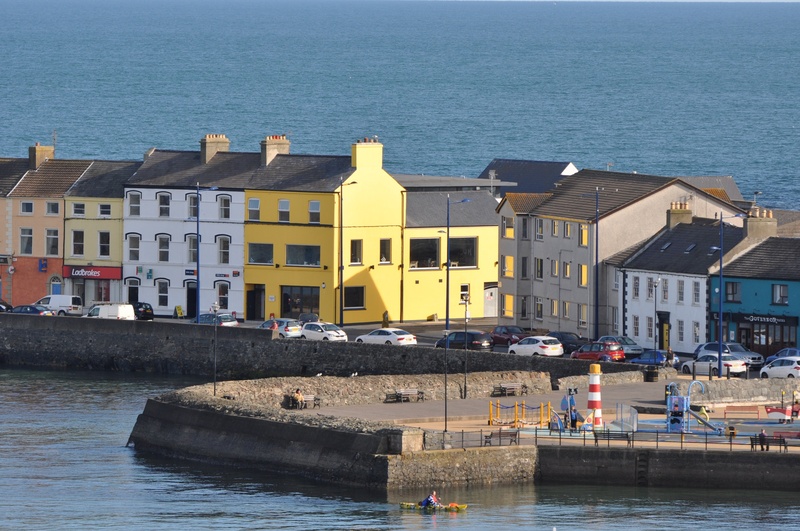 Another source of information about the history and future of the town is a recent government document – the Donaghadee Town Centre Masterplan of March 2015. 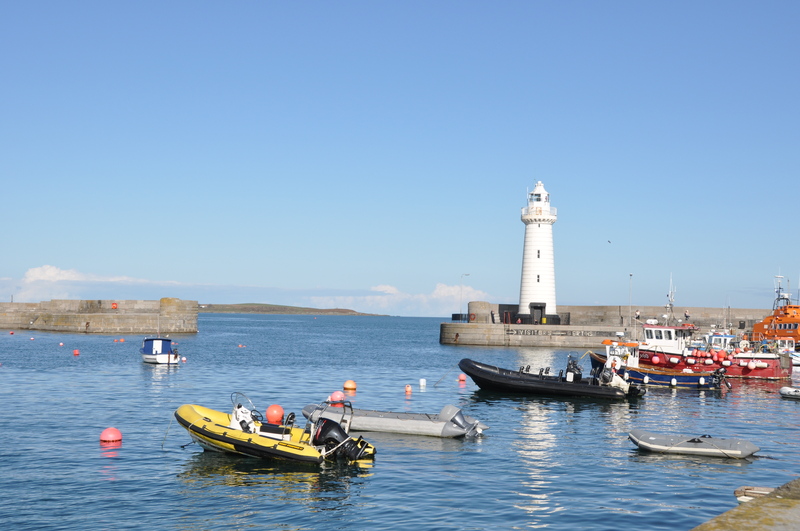 A project is underway to create a maritime museum in Donaghadee – click here for more details. Which other townlands lie close to the Town Parks of Donaghadee? From north to south, Ballywilliam, Ballynoe, Carryreagh and Ballyvester. Which council area is Town Parks of Donaghadee in? Ards and North Down. Which county is Town Parks of Donaghadee in? County Down. Finally, click here for the PLACENAMESNI website to see a map of the townland of Town Parks of Donaghadee and to read more about the origin of the name. Remember last month’s post on the Town Parks of Comber, where older townlands had been subsumed into a single unit as the town grew? 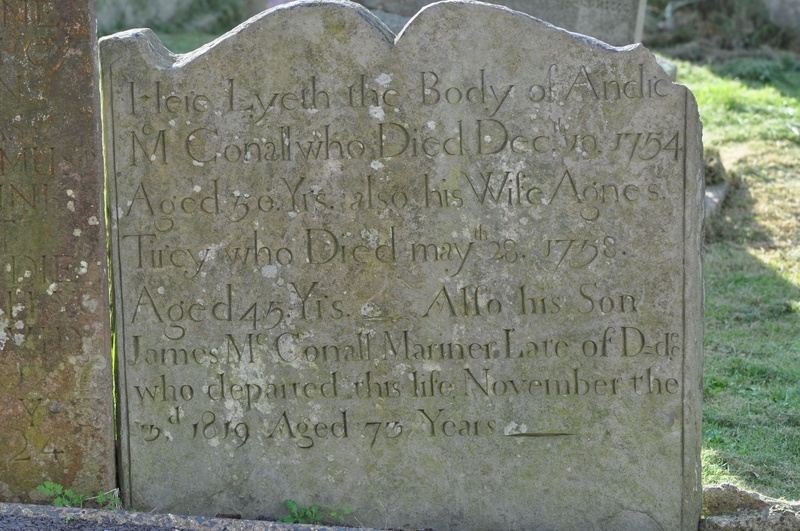 I had been hoping that Donaghadee would be the same, but I don’t have any information on older townland names for it. Previous One Year Old Today! Lovely blog that I’ll regularly return to. Regards Thom.